This celery cilantro soup is a big hit everywhere I have taken it. I always get requests for the recipe! 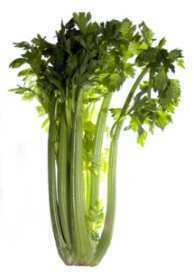 If you want to make it creamier, simply add more celery stalks and a little more almond butter or olive oil. This recipe has been kindly contributed by Susan Schenck, the author of the two-time, award winning book The Live Food Factor, The Comprehensive Guide to the Ultimate Diet for Body, Mind, Spirit & Planet. Her book has gained the reputation as the raw food encyclopedia or bible. Blend in a Blend-Tec or Vita-Mix, adding a little of the ingredients at a time until creamy. Serves about 10.